I had shown here (for NIKON CP FE) and here (for SIGMA FE) that a FishEye has no fixed nodal point along the optical axis. It all depends on the aspect angle that the photographed object is at wrt the opical axis. I have also concluded that the only way to totallly avoid parallax error would be to stitch two semi-spherical opposite views. To do this, more than 180deg FOV is necessary as some overlapping shall allow to set some control points for PTools optimization. The FC-E8 Nikon lens makes most CoolPix cameras able to do MacroPanos from two shots, thanks to its 187deg actual FOV (183deg usefull). However, the natural resolution is limited to about 1500pix/180deg. I have enjoyed doing many PanoraMacros with a CP950 and later on with a CP990 some years back. A conventional "full size" 35mm film camera equiped with a 6-7mm FishEye lens will also fit. The resolution can then be 4000pixels/180deg or even more depending on scanning means. But such a FishEye is very rare, very bulky (So large that it could not fit in my fridge!) and VERY expensive. A full size 35mm DSLR is equivalent but at a lower natural resolution (3000pix/deg). While being of good quality, affordable and therefore very popular, the SIGMA 8mm is unfortunatly limited to exactly 180deg FOV. More, the APS sized DSLR such as most Canon EOS, Nikon (& Fuji), Olympus, Pentax etc. 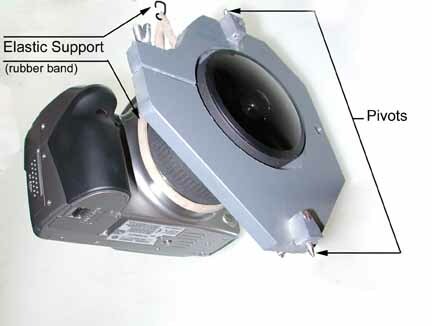 have a sensor that is too small to cover the complete SIGMA 180deg FOV along the sensor smaller axis. Slight cropping hampers full circular coverage. As I own only a Canon EOS 300D and a SIGMA 8mm, I simulated first having an EOS-1Ds and secondly having a 190deg (7mm focal length like) HFOV fisheye. Images 0 and 1 make (well, almost) a complete composite circular FishEye image (0+1). Images 2 and 3 make another composite circular image (2+3) opposite to (0+1) i.e. at 180deg of yaw and beta=90deg. Image (4+5) covers most of (0+1). It also overlaps slightly a side of (2+3). It also fills two gaps at the corners of (0+1) and two gaps at the corner of (2+3). Image (6+7) covers most of (2+3). It also overlaps slightly a side of (0+1). It also fills two gaps at the other corners of (2+3) and two gaps at the other corner of (0+1). B) The nodal point is of course set for beta=90deg. This induces very slight parallax errors in two narrow vertical strips in the equirectangular panorama. This is due to the 10deg Yaw offset of Images (4+5) and (6+7) that would require rotation around two different nodal point locations (impossible ubiquity). But that can easily be retouched in photoshop because such a small rotation angle is very tolerant (remember: for beta near zero, any point on the optical axis will theorically fit). A clamp is fixed around the front part of the FishEye permitting roll adjustment (e.g. rotation from portrait to landscape mode). It's made from a 9mm thick PVC plate (RadioSpare). Two steel made sharp pivots on the opposite top and bottom ends of the clamp allow yaw rotation and accurately around the nodal point. 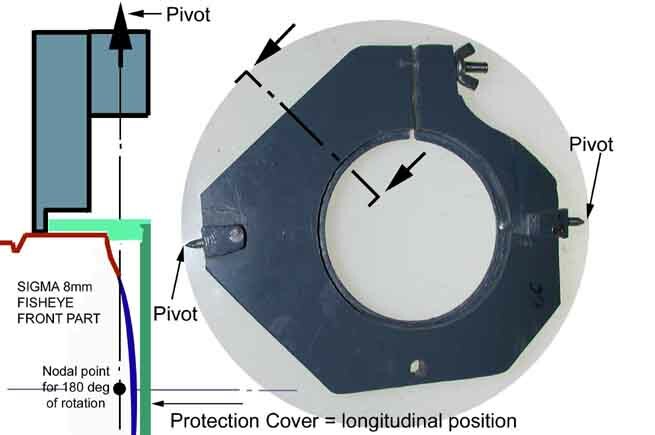 Very precise longitudinal positioning of the nodal point along the optical axis is assured by using the SIGMA provided front protection cap (shown here in green) as a depth positioning gauge. Tip: An elastic rubber band relieves the load of the camera and lens (at their C. o. G.) when hooked up at a bar of the grid at the upper tier level. I have made this panorama with the process that is described in detail at the top of the page (EOS 300D/ Rebel, Sigma 8mm). Sigma 8mm fisheye and four shots (yaw= 0, 5, 180 and 185deg ) on a single row; f/16; 8sec. I had done the same scene back in 2000 with a Nikon CoolPix 990 and a FC-E8 fisheye converter. CP990, EOS Rebel 300D, and EOS Elan 50E. This is a QuickTime movie that was made with a similar method to above described. For those who like WW II airplanes, I have set up a collection that you can explore. When you fly the mouse over any one of the planes, its features appear as words at the bottom of the movie frame. Beware, the file is VERY heavy (2.5MB) : this panorama was originated from scanning 35mm negatives shot with the 8mm SIGMA on a standard EOS50 Elan from Canon.